Discordant Harmony is a series of exhibitions based on the notion of a historical, political and cultural entity of Asia, which, from an Asian perspective, is a European notion. In reality, the continent has rigid historical and political boundaries. For the transnational project Discordant Harmony, the Goethe-Institut invited four curators from Beijing, Taipei, Seoul and Hiroshima to use artistic positions to initiate a critical dialogue about the cultural and philosophical commonalities of Asia. Following the launch in Seoul, the exhibition will be on view in Hiroshima until 6 March 2016. We spoke with the head of programme work for the East Asia region, Reimar Volker. Dr Volker, the title of the exhibition, Discordant Harmony, thwarts the conventional cliché in Europe of Asia as a harmonious society. Why is the concept of harmony in Asia so worthy of discussion? Asian culture is highly influenced by Confucianism. The first and foremost association with Confucianism from a western viewpoint is the pursuit of harmony. And harmony actually is an element of Asian aesthetics and coexistence, indeed all social interaction. In many ways, this makes the concept dazzling and omnipresent, but also open to usurpation, in particular politically. In 2005, China’s then president Hu Jintao declared the “Harmonious Society” the state doctrine. What can the artists contribute to the discussion about the concept of harmony? The curators defined the exhibition as a learning and research field that presents different perspectives on Asia or on the notion of harmony. The viewpoints are deliberately very divergent, as are the formats and media used in the artworks. They ask questions in fascinating ways about the concept of harmony and the individual and collective identity of Asia. Some of them are works that make reference to a specific place, put multiple places in a context or focus on music or dance removed from specific locations. The project is also about not leaving the authority to interpret the concept of Asia to the political sphere. In all nations of the region of East Asia we are experiencing this kind of representational claim. Each country claims to speak for all of Asia with large museums, biennials and exhibitions. We are very happy that the exhibition has managed to become a platform that will not be politically exploited and in which the artists do not feel co-opted; they can present their personal visions on the subject and put them up for discussion. What relevance does this discussion have for Europe? The discussion is interesting because it challenges the dominant concept in Europe of Asia as a single entity. The range of voices and perspectives is huge. There are also interesting links. Northeast Asia, similar to Europe 25 years ago, is still strongly influenced by divisions that originated in the Cold War: North and South Korea as well as China and Taiwan. In addition, there are still major tensions that go back to Japan’s imperial past. Is Europe perceived in Asian countries as one historic, political and cultural entity? Europe seems to be known more as an abstract concept and less as a living entity. A lecture is available in the exhibition and on the project website by the Chinese literary scholar Wang Hui on the topic of why East Asia can never merge into one unit as Europe, even if it may seem natural. How did the media in Korea react to the project? Response to the exhibition was very positive in Seoul. We had nearly 50 articles in newspapers, magazines and on TV. The subject appeals to a lot of people in a region where art can build a bridge between countries whose political relationship is still very tense. The exhibition will be shown in four countries of East Asia and enhanced with locally pertinent works at each stop it makes. The show is presently being presented in Hiroshima for the 70th anniversary of the nuclear bombardment of the city. What artists did you invite to take part here? „Cumulus. Hiroshima Peace Day“ by Yoneda Tomoko | © Yoneda Tomoko The curators invited 16 artists from China, Korea and Japan for the exhibition in Hiroshima. 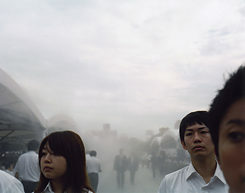 The exhibition looks beyond Hiroshima to the present and future of the entire region, which is why the subtitle is “Reflections on the Imagination of Asia.” Some of the artists created site-specific works that take this perspective into account, for example the work by the Japanese artist Yoneda Tomoko who produced a series of photographs she took in all of the participating countries. Who is the audience of “Discordant Harmony”? What do you aim to accomplish with the project? Discordant Harmony is, of course, initially aimed at the interested general public, not only in the countries where the exhibition will be on view. With their local partners the Goethe-Instituts in the region form a neutral platform with the project that allows critical examination of the topic. This multilateral approach, which is not primarily aimed at a direct exchange with Germany, is what makes the project so special. It creates links, opens perspectives and spaces for discussion that are unique under the current political conditions. Which of the works impressed you the most personally? I was particularly moved in Hiroshima by the work of Byungjun Kwon. “The Bell” was produced on site. Two huge temple bells from Japan and Korea are constantly being struck by a small motor. The different vibrations are then processed electronically and merge into a combined tone. This elegantly translates the historical and present tensions between Korea and Japan into physical vibrations, which resolve in a single note. That fascinated me not only as a musicologist, but also created an arc back to my initial research for the project. 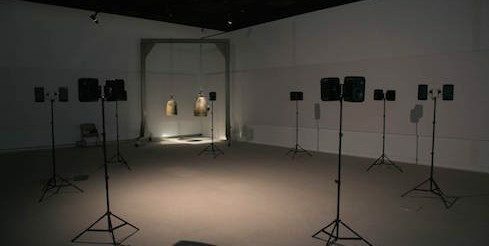 In the key work Chinese Thought by the French sinologist Marcel Granet (1884-1940), the sound of the bell is described as a centre of the Confucian concept of harmony. Gabriele Stiller-Kern conducted the interview.